The way to a Pinoy's stomach? 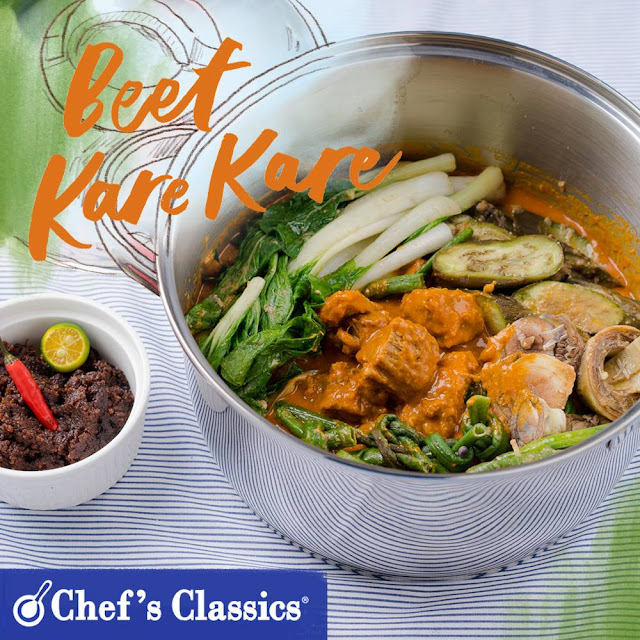 A mouthwatering pot of beef Kare-Kare. Learn how to cook it with our simple recipe. 1. In a Chef's Classics pressure cooker, boil beef, tripe and oxtails in water for 40 minutes or until cooked and fork tender. Strain and keep the stock. 2. Heat a Chef's Classics Ashley Sauce pot, add in cooking oil and the atsuete oil. 3. Saute garlic and onion until color changes to light brown. 4. Add in beef stock, toasted rice, beef, oxtail and ox tripe. 5. Add in peanut butter and bring to boil. Simmer for 15 minutes. 7. Add eggplant, string beans, pechay and banana bud. 8. Cook the vegetables for 2 minutes. Do not Overcook vegetables. 9. Serve with bagoong or shrimp paste on the side and steam rice.